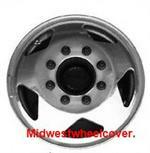 1060, Hubcap used, 15", 75-80, BUICK, PASSENGER, CENTURY, ELECTRA, LESABRE, PARK AVENUE, REGAL, RIVIERA, 5 SLOT TYPE. 1145b, Hubcap used, 14", 96, BUICK, SKYLARK, OPT W43 (OLYMPIC), CHROME, 5 SLOT, GOLD POCKETS. RED, WHITE, & BLUE LOGO IN CENTER, METAL CLIPS. 2002, Used Rims, 15X6, 6 LUG, 4-1/2", 91-93, DODGE, DAKOTA, 5 SLOT, SILVER, STEEL RIM. 2037, Used Rims, 15X6, 6 LUG, 4-1/2", DODGE, DAKOTA, 5 SLOT, CHROME, STEEL. 2037, Used Rims, 15X6, 6 LUG, 4-1/2", 94-96, DODGE, DAKOTA, 5 SLOT, CHROME, STEEL. 3179, Hubcaps used, 15", 90-94, CHEVY, LUMINA CAR, 5 SLOT TYPE WITH WORDS CHEVY MOTOR DIVISION, AROUND CENTER. 319, Hubcap used, 14", 67-69, PLYMOUTH, BARRACUDA, VALIANT, CHROME OUTER RING, MACHINED WITH 5 SLOT TYPE. DISHED CAP WITH RIBBED TOWER & BLUE LOGO IN CENTER, METAL CLIPS. 3196, Hubcap used, 14", 72-75, CHEVY, LUV PICKUP, 5 SLOT TYPE. 3207, Hubcap used, 15", 92-95, CHEVY, LUMINA VAN, 5 SLOT TYPE, WITH CHROME TRIM RING, LUG NUT RETAINING CAPS USED. 3211a, Hubcaps used, 14", 93-97, GEO, PRIZM, 5 LOT TYPE, 5 SPOKE, 4 FAKE CHROME LUG NUTS, PAINTED BLACK IN POCKETS, WORD GEO IN CENTER. 332, HUBCAP USED, 14", 68-69, PLYMOUTH, PASSENGER, 5 SLOT TYPE..
332, HUBCAP USED, 14", 68-69, PLYMOUTH, PASSENGER, 5 SLOT TYPE. 345, Hubcap, 15", 69, PLYMOUTH, PASSENGER, 5 SLOT TYPE. 3962d, Hubcap used, 13", 66, CHEVY, CHEVY II, 5 SLOT TYPE. METAL CLIPS. 4020, Hubcap used, 14", 70, OLDSMOBILE, F85, METAL, MACHINED FINISH, 5 SLOT TYPE, BLACK ENGRAVED LOGO, 4 SETS OF METAL CLIPS. 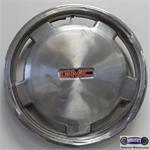 4020, Hubcap used, 14", 70, OLDSMOBILE, F85, METAL MACHINED FINISH, 5 SLOT TYPE. WITH BLACK ENGRAVED LOGO IN CENTER. 4 SETS OF METAL CLIPS. 4099b, HUBCAP USED, 14", 85-86, OLDS, CRUISER, CUTLASS CIERA, EIGHTY EIGHT, NINETY EIGHT. 5-SLOT TYPE. CREST EMBLEM.